Mabel, Sunday 15th June 2008 My husband, David & I went for breakfast before our church service. David began feeling unwell so we decided that he should go home to rest while I went on to church. That day, I had a bad headache so I went home for a nap after church. David was not in and messaged that he was in Changi General Hospital (CGH). At 7pm, David returned from the hospital. However, he still felt very uncomfortable so we hurried back to the hospital where the doctor decided to ward David for further observation. Mabel, Monday 16th June 2008 I went to Changi General Hospital (CGH) the next morning to find David shaking in a fit. He said he could not see and then suddenly he lost consciousness. The doctors attending to him decided to transfer David to the Singapore General Hospital (SGH) where they had more experience in dealing with liver problems similar to that which they had diagnosed David to suffer from. David, Monday 16th June 2008 I was at CGH when I must have passed out. One moment I was in hospital, the next, everything around me became a blur. Then I suddenly became detached from my body. A bright, big doorway was before me and I walked through. On the other side of the entrance, an angel met and led me to be judged by God. He explained about the Book of Life, saying that those who backslide and denied Him would be condemned to the Hell. Those who accepted Jesus as their Saviour, are faithful, and fear God, reading the Bible and worshiping Him will go to Heaven. Their names are found in the Book of Life and will be accepted and welcomed by God himself, into Heaven. Then I met Jesus! I could not see His face as it was dazzlingly and shining but I knew it was Him. Mabel, Monday 16th June 2008 David was at SGH’s ICU (Intensive Care Unit). He was in a coma and in a critical condition. Many tubes were plugged into him. The breathing support machine sucked air into his body and in the background, the heart-monitoring machine beeped, ticking the time he had left on earth. Doctors explained that his liver had failed and toxin had spread to all of his body. They told us to prepare for the worse. David, according to the doctor, was brain-dead. My whole family, mother-in-law and relatives all were weeping. Many people prayed earnestly for David. David, Nil date Heaven is amazingly beautiful. It is bright and shining, singing and worship music filled the atmosphere. Angels are everywhere. So are many happy people who had accepted Jesus. There is no need to have any food and there is no sickness. Our spirits feed on the word of God. The words “Holy, holy, holy” seemed to resound in my head. The angel beside me told me that Hell is drastically different. It is a heavy, dark and burdened place. None can see through the blinding darkness of hell. Mabel, Tuesday 17th June 2008 David was in a coma and did not wake up. His condition did not improve but became increasingly worse. Brother Lai told me more about Heaven. He said Heaven is a beautiful place. In the back, I could see a cross. Those who accept Jesus would be at Heaven. Hell is terribly different from Heaven. It is a place of suffering where backsliders and those who deny Jesus who are judged, are sent. Brother Lai explained that God would clean our unclean and sinful hearts, leaving cleansed hearts in us if we confess. It is simple to confess our sins to God as He forgives us easily and readily. Brother Lai asked for a favour from me. Could I tell Caroline Phua-Wong that he is happy in Heaven? He said that Caroline used to visit, care for and clean him for a very long time when he was sick in a nursing home. I realized amazingly that we talked without using sign language! In Heaven, we do not need the sign language for we could all talk like normal people. Brother Lai looked younger and very different from when he was alive. Former Senior Pastor P. J. Johnny looked wonderful. He was happy and very much younger in Heaven. His face was filled with glory and shone. I was again aware that I could talk to him normally. Mabel, Wednesday 18th June 2008 David was still in a coma. Doctors approached us about the possibility of removing him from the breathing support machine. There was no improvement in his condition and he was beyond the doctors’ abilities to save. It would be useless for David to have a liver transplant, as there was absolutely no hope for recovery. Doctors explained as kindly as possible the expensive cost of keeping David alive on the breathing support machine. It would be a pointless financial burden for us. About 5pm that day, doctors again suggested that the family consider removal of the life support systems from David. I stopped them. I wanted my children and relatives to have a chance to be with David while he was still alive even though he was in a coma. David, Nil date I met my father, sister and relatives who were Christians – they looked younger and happy too. They encouraged me to walk the straight path of Jesus, be faithful to God and not to backslide. God spoke to me. He said we look old on earth but we will look young when we are in Heaven! He even showed me how young my wife, Mabel, would look when she is in Heaven one day. I was astonished. Mabel, Wednesday 18th June 2008 Our children, relatives, friends and pastors came to pray for David. The decision to remove the life support systems from David twisted like a strangling cord round my heart. I cried continuously, frightened to make the life and death decision for David. My daughter, Christine, Senior Pastor Kenny Chee and Pastor Barnabas Phua discussed funeral arrangements for David by both her church and WRPF in preparation for his passing on. Kenny, Barnabas and a few members of WRPF gathered inside David’s ICU room to pray for the faith to let God take over the situation. Tubes from David’s mouth were smeared with blood – he had lost a lot of blood. It was time for me to make the final decision on the removal of all life support systems from him. My daughter, Christine, and son, Jeremy, agreed to let their father go and I consented. At around 11pm, doctors removed the oxygen mask. They expected David to pass on within 48 hours. My children and I stayed by his side praying and crying for him all night. David, Nil date While I was in Heaven, I could see my body in the hospital bed. My wife, son, daughter, mother, siblings and relatives, my daughter’s church pastor and her church friends, WRPF church Pastors Kenny Chee, Barnabas Phua and church friends were all praying for me. Jesus told me to go back to my family and take care of my liver. He asked me to control my hot temper and anger. He said the Bible is the truth. I must read it to keep close to Him. He gave me a last reminder about the Book of Life before sending me back. I said goodbye to Him and the angel led me to a small door. I walked to open it. The next thing I knew, I had woken up. I am still alive. Mabel, Thursday 19th June 2008 When the morning came, three doctors checked on David and found his eyes opened! His breathing was completely normal. The doctors were extremely puzzled and asked me how David woke up alive and well. This was something they never expected. Christine and I immediately told them that our God healed him. It was unbelievable to the doctors. A complete check was made on David and they pronounced him well. He was transferred to the Intensive Care Unit for more observation. Drips and the feeding tube were again attached to him. David could recognize all of us; his family, relatives and friends. When many came and saw him, thanksgiving and praises to God overflowed. I am very grateful to God for bringing David back to us safely. David, Thursday 19th June 2008 I am thankful to God for those 3 days of coma and the unbelievable and enriching experience of Heaven. Mabel, Friday 20th June to Saturday 5th July 2008 Daily, David showed physical improvement. Doctors monitored his liver and high blood pressure condition. He was finally discharged on 5th July 2008, after 2½ weeks in hospital. When David shared his experience of heaven with us, we were amazed. Caroline Phua-Wong was shaken to hear Brother Lai’s words for her. Her visits to him had been done in utmost secrecy and no one could have known about it. We give glory and praise to our real and Almighty God. We would like to thank all their prayers for him and all of us. Hallelujah! 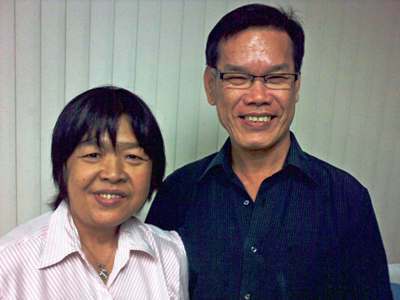 Pastoral note: David and Mabel Chang are faithful deaf members of the Deaf Faith Fellowship, a ministry of World Revival Prayer Fellowship. Mabel has since gone home to be with Christ.